In the forests of Waikanae where the material for this mask was collected, an entity who cannot speak, silently represents fauna and flora. A spirit of nature fixes us with a gaze in response to environmental damage being inflicted on our world. Do we return the gaze or do we look away and distract ourselves from the pressing truths of our own nature? Science has finally and at long last declared that plants do indeed communicate, are inter-dependant and exchange information among themselves and between all life-forms, insects, other animals. Until recently in our evolution and recent tenure as chiefs of the food chain we decided to stop concerning ourselves with other beings and to deny their experience. Only Homo Sapiens does this and we do this in isolation, loudly and individualised. Contrarily a mute form watches. An homogenised character wearing a bowler hat and safari suit posits an holistic view. 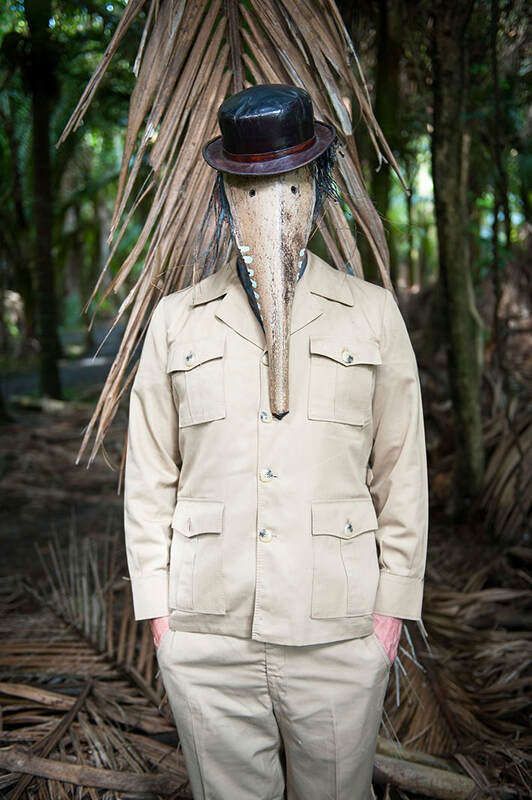 Magritte used his bowler hat to express anonymity, I use the safari suit to blend in while the mask hides the wearer. "Everything we see hides another thing, we always want to see what is hidden by what we see." - René Magritte.